On the lower part of the Curse-rotted Greatwood room. Examine the wandering Hollow Manservant with a cage on his back. The player will then be teleported to the Pit of Hollows area. Talking to Hodrick gives access to the Mound-Makers covenant. You can only talk to him before fighting the Curse-rotted Greatwood, as he will die once the boss falls down onto the area where he resides. As an invading phantom, right before the Dilapidated Bridge bonfire. As an summonable invader. His summoning sign will appear on the left side of the building leading up to Crystal Sage. The player can fight alongside Sirris of the Sunless Realms against him after Aldrich, Devourer of Gods is slain, if they are following her questline. Her summon sign is found just before Curse-rotted Greatwood's boss room, before the hole on the ground. Holy Knight Hodrick is a NPC and a member of the Mound Makers. He will be gone after the Curse-rotted Greatwood fight, as the boss falls on the place where he is staying, so you can only talk to him and join the covenant before that. 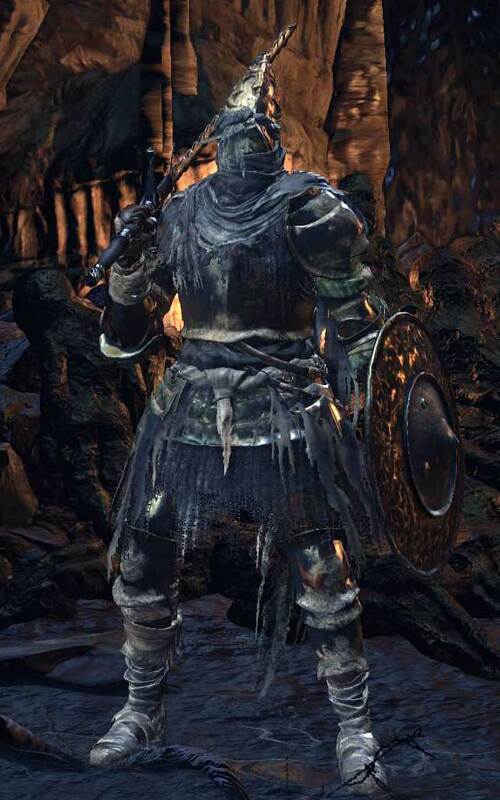 His armor set can be found in the Pit of Hollows after the player kills him together with Sirris of the Sunless Realms. This pit is for Hollows, not for the likes of you sane folk. Or perhaps you are a Hollow, posing as otherwise? Yes, yes, then we're just fine.. But we'll all be mad, soon enough. And should you be Undead, well, all the more so. No, no, of course you're not. That's what you mad fools always say. Beware, the shackles of the Gods are fragile. You might need this. Etch it on your heart if you feel your sanity slipping. Come here to pile up your victims, for that will form your anchor. You'll see when you go mad. They'll be your family. You'll go mad one day, but not today. This pit is for Hollows, and for the occasional madman fond of piling up victims. You've better things to do, I'd hope?